Check out the front page of Saturday's San Antonio Express-News. Gov. Rick Perry's image as a hunter is so important in Texas politics that his campaign provided this picture. And so, of course, the Express-News dutifully ran the picture on the front page of the paper today. Thank you, Express-News! I'm sure the Rick Perry for Governor campaign greatly appreciates it! Sheesh! I suppose tomorrow they might as well formally endorse the governor and drop the charade of being objective in this election. On Sunday the E-N had another story on the governor’s race, this one about the importance of religion in the campaign. The only surprise was that they did not run a photo of Gov. Perry on his knees, praying in church. I suppose the Rick Perry for Governor campaign missed a great opportunity by not supply the E-N with that photo. The one thing that still strikes me about 9-11 is how ingenious it was. They couldn't fly a plane over here and drop bombs on us, so they hijacked planes instead and turned them into bombs. The hijackers didn't need explosives or WMDs. Just some box cutters. Nobody saw it coming and thus they were able to pull it off at first. But the novelty wore off before the attacks were even finished. Once the passengers on United 93 found out via cell phones that other planes had been used to strike the World Trade Center and the Pentagon, they fought like hell and brought the plane down. That's why there will never be another 9-11 like that. It doesn't have anything to do with what President Bush has or has not done with regards to Homeland Security. It is simply a matter of a change of perspective of airline passengers. A terrorist today could not take control of a plane using just a razor blade or a knife. People today just aren't going to let them take control of a plane without putting up a fight. The days of passengers sitting back on hijacked planes expecting that they will just be flown to some other location where the hijacker will seek asylum are over. In fact, I would bet there have been fewer hijackings since 9-11 because of this. I don't actually know if that is true, but that would be my guess. And even if someone did get control of a plane, our military would not hesitate to shoot it out of the sky before it could get near any major target areas. What still worries us, however, is that bin Laden probably knew it was a one-shot deal and is now busy plotting other very different, but equally ingenious ways to attack us. That fear of the unknown is what has kept the Bush administration propped up these past five years. But now, at long last, people are finally starting to realize that this president, the worst president in modern history, is not making us safer and more secure. To the contrary, he has depleted our military resources, inflamed Muslim passions against us and provided al-Qaeda with incredible recruiting opportunities which they are currently using to great effect in Iraq and Afghanistan to launch suicide bombing attacks everyday. I’m still wary of being overly optimistic about the upcoming mid-term elections, but stories like this one are beginning to give me hope that the American electorate may have finally regained its sanity. This administration has been a complete and total disaster by every conceivable measure. There is nothing they can show as a positive in trying to make the case for keeping their party in power and the best they can do is yell “Booga, booga!! The terrorists are gonna’ get you! !” at every opportunity. In 1994, Democrats lost 53 House seats as Republicans took majority control of Congress for the first time in decades. In 2006, Republicans need only lose 15 House seats to lose their tentative grip on the House majority. 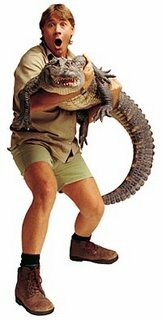 I hated seeing the news about Steve Irwin dying the other day. I think it is the most tragic celebrity news I’ve seen since the late Christopher Reeve fell off his horse and became a parapalegic. Irwin was the kind of guy you expected to live forever, despite the fact that he constantly took risks. Kind of like Evil Kneivel. The Crocodile Hunter was a favorite show at our household where the TV can usually be found skipping between Animal Planet, The Discovery Channel and Home and Garden Network. I think what disturbed me the most is that he was only a few years older than me and his son is the same age as my little boy. Life is precious and he lived it to the fullest. My most sincere condolences to his family.